Wow, those are all great! We don't have a heated bed but we bet they are wonderful. Wow Truffles, I didn't even know they made those types of beds! If we bought one I am afraid that Scooby Doo (chihuahua) would still the bed from Molly. BOL! I bet you do get cabin fever living in Vermont. I sure hope you at least have a bird feeder or something to bring the wildlife to your windows. I know I love the realistic pictures of staring out the window. I am so unfancy and just made a heated cat bed by cutting a hole for the cord of a heating pad between the layers of a favorite bed. I am going to check out the window sill bed though. We have been wanting one of those and a warm one would be even better! My cats are easier to content, they just sleep in front or on the radiator ! Except Rosie nobody likes baskets ! We don't have heated beds although as Hannah sleeps next to Mum through the night she enjoys the warmth. While the radiators are on Lucy gets on the window sills above them and warms her paws there. Of course we both manage to get on Mum's knee for a warm too if she's sitting down reading or watching TV in the evening. These all look great. The mom once put a heating pad in one of our cushions and y'know what? We didn't use it! We must be crazy. MOL! She would like to get us a heated bed, but based on experience, we may not use it. The sack (#1) would look great on you, Truffles! If the budget supports it next month, I want to get Carmine a heated cat bed for his birthday (Feb. 18). I know that he would just love one! Those all look great. We have heated throws ( human ones) that I bought at Target for $20, I keep them on low and they have a heating pad I keep on low and covered with a fleece blanket. Mes has beddie #5! Mes loves it. It helps my arthritis too. Mommy loves it because she finds mes a bit "cloying" in my snuggling in the middle if the night to kjeeps warm. Mom bought us a little cat house to go into and none of us, yeah Mom thought WHAT??? We do live in FL and although it gets cool and sometimes down to freezing we really have few days and nights like that. But up there in Vermont we think one of those beds would be a great idea for you Truffles. They make beds that are heated? MOUSES! I never knew... Only heated beds 'round here are ones recently vacated by a member of my fur-fam. Or even a chair recently vacated by a peep will do. I am SO GONNA tell my peeps about these. Excellent post! We have a heated cat cup and have "guilted" the Mom into keeping it plugged in year round. MOL! Wow Truffles those awe pawsum. We luv da leopawd purrint too, as we fink it goes well wiff any decor or fur color. MOL Hope you get one of those pawsum beds. We wuld ask mommy fur one, but she wuld just say we alweady hav a lectwic blanky and no extwa gween papers. 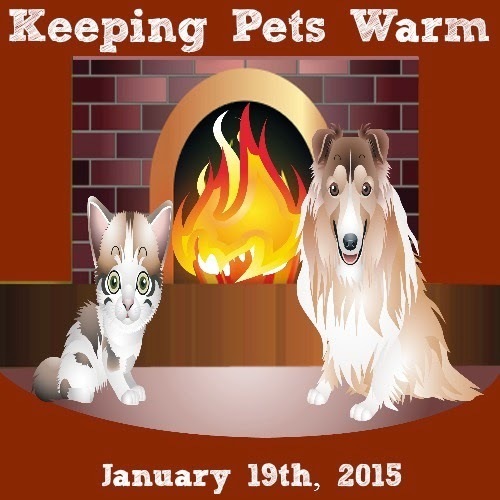 MOL Stay warm. When Autumn was old, she had a heated bed. It wasn’t a fancy electric one but one with a layer of insulation like aleuminum foil in it. It would reflect her body heat. TW threatens to use Reynold’s wrap in my bed. She’s always afraid of electromagnetic fields and cancer. 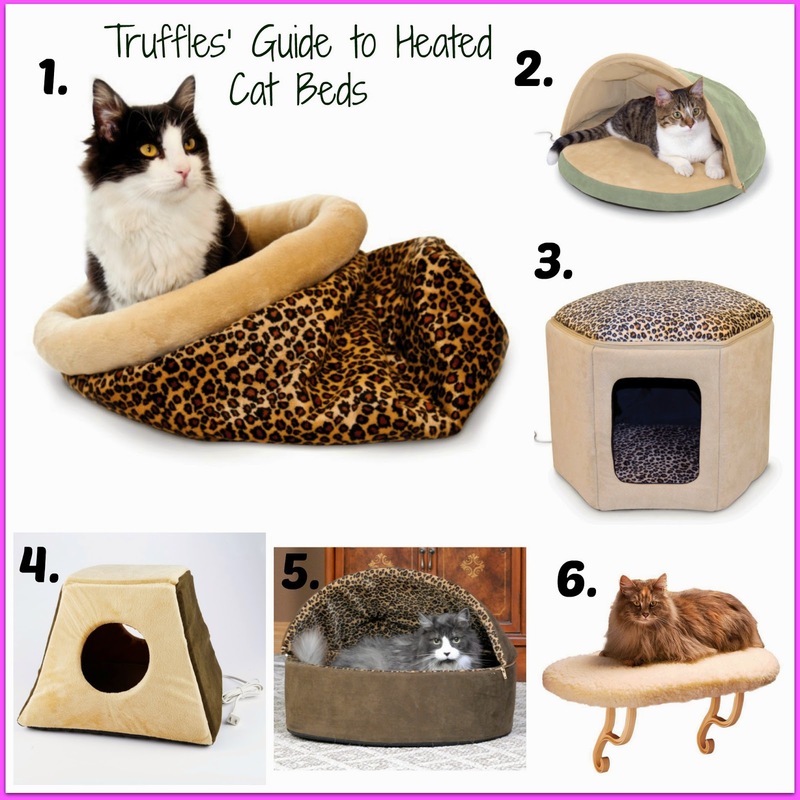 A heated cat bed sounds purrfect! We think Delilah would love one. #2 and #5 are our favorites! # 5 us getting our vote followed close by #2! We're angling for the heated accessory to our sleepypod. We think it's make nice addition to our home, Mommy. Mommy? Those are really neat... I had no idea they even existed! Meeee owwwwww! !